Financially supporting a child is a responsibility that the majority of parents accept and consent to by paying child support consistently and on time following divorce or separation. Paying this amount every month is not necessarily easy, but knowing the money goes toward the necessities of their child’s life is enough to counteract the strain this obligation puts on a parent’s finances. However, an unfortunate turn of events comes to almost everyone at some point their lives, and the consequences can severely alter a person’s ability to pay financial obligations, as well as his/her long-term financial outlook. The state of Florida views the non-payment of child support very seriously because single parents with the majority of time-sharing of a child are much more likely to need public assistance if child support is not forthcoming. As a result, the law gives courts a number of options to compel compliance with an outstanding child support order that can even lead to jail if a parent repeatedly refuses to pay. One tactic frequently used to coerce a parent into paying is to suspend his/her driver’s license until a payment plan is drawn up or the overdue amount is paid. In fact, Florida is one of the states that most frequently suspends licenses for non-driving offenses. Before the situation escalates to this level, a parent facing difficulty meeting child support obligations should request modification so the court knows the parent is making an effort to comply with the court order. Either parent has the ability to ask a court for a modification that increases or decreases the support payment, and must demonstrate that a “substantial change in circumstances” occurred since the original child support amount was calculated. Child support is always based on the income of both parents and the child’s needs, so Florida law requires that in order for a change to be substantial and justify modification, the new information must result in a change of at least 15 percent or $50 per month, whichever is greater. 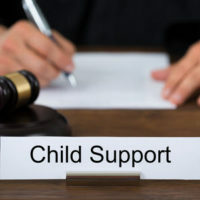 In addition to directly petitioning a court for modification, a parent paying or receiving child support through the Department of Revenue’s Child Support Division can ask the Division to petition the court for a change in support on his/her behalf. However, it usually takes much longer to get a modification, and communication with the Division is difficult due to large demands on its limited resources. an increase in income for either party that is significant enough to affect the child support calculation. Child support is a serious commitment and should not be taken lightly. If you are struggling to pay child support and think a reduction in the payment amount is warranted, consult a family law attorney about the possibility of modifying the monthly amount. Being proactive in this matter will prevent future complicated issues if/when your ex-spouse seeks to enforce the support order. Family law attorney Joyce A. Julian, P.A. represents clients in the Fort Lauderdale area in family law issues, and will work with you to find a resolution that best for you and your family. Contact the office for a free consultation.